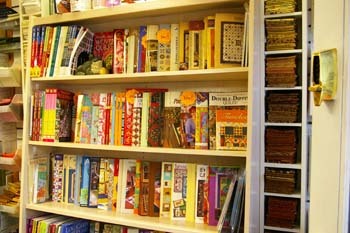 Fabric, Notions, Books and Patterns purchased for these classes will receive a 10% discount! Please note you will need to purchase the items that are required for each class unless it is stated on the supply list that they are included in the fee. To continue to offer great classes at A Quilter's Garden, we encourage you to consider us as your first choice when purchasing class supplies and fabrics. We have up to six seats per class and in most cases require a three student minimum to continue a class. If you are interested in taking a class please stop in or call us at 802-223-2275 to reserve your spot. We do offer machine rentals for classes too. Our registration and cancellation policies are below. 2019 Vermont Shop Hop - 15 Shops - 10 days - great prizes! March 22 through March 31 - extended hours! Party At the Garden!! - Why not let your guests learn a new skill and make something fabulous while you celebrate? Here's a list of some types of parties we offer. If you have an idea, let us know and we'll have coffee and talk about it! Baby Shower: 2.5 hours. Each guest will make a quilt block for the baby-to-be. Our staff will finish the quilt for the lucky mama! Water, coffee and tea included. You bring cake, snacks and paper goods and additional beverages if desired. Up to 8 people. $300.00 and up. Class Registration Don't wait to register. We pride ourselves on our large, clean classroom; but to ensure that each student has space to work, class sizes are limited. In most cases we require a minimum of three students, and a class will be cancelled if that number is not met. Fees are due when you register. This will hold your space in the class. You may register over the phone, in person at the shop, or by mail, using a credit card, cash or check. If a class that you are interested in is full, we can put your name and phone number on our waiting list. All classes have a supply list of necessary items. Some of the classes require prep work before class. Please review your supply list when you receive it so we can answer any questions. We respect the copyrights of books and patterns. Students are required to have their own book/pattern for class. Class supplies can be purchased at our shop at a 10% discount. We want your project to last at least a lifetime, so we work very hard to ensure that items used for classes are in stock and of the highest quality. Cancellation Policy You will receive a full refund if we cancel the class. If you notify us up to one week before the scheduled class you will receive a store credit towards another class. No refund or credit will be given if cancellation occurs less than 7 days before a class. Make up classes due to weather (or our need to reschedule a class) will be arranged. Our policy for bad weather, if Washington County schools are closed due to bad weather, all classes for that day and evening will be canceled and rescheduled. Sewing Machine Rentals for Classes Don't want to deal with the hassle of bringing your machine to class! Not a problem. BERNINA sewing machines are available to rent for any of our clubs, classes, or workshops. The rental fee is $20 for a full day or $10 for a half day or less. (Advanced notice may be required). Please note that thread and sewing instructions are not included in the rental fee.